Bhagwat Gita Slokas (Quotes) in Sanskrit with Meaning (Translation) in Hindi and English. These Bhagwat Gita quotes are on Karma , Life , Death and other topics. 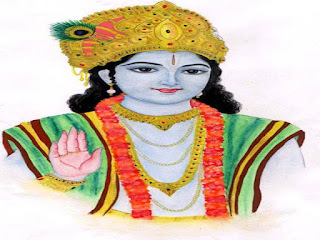 In this post we have collected Most Popular Bhagwat Gita Quotes with meanings in Hindi as well as in English language , these quotes are originally written in Sanskrit. Gita is the collection of 18 lessons , we get in depth knowledge from this holy book. Every slok of this book is complete in itself and ocean of knowledge. In this article I collect the 5 popular bhagwat gita sloks with interpretation in Hindi and English. Ma Karma Phalehetubhume te Sangostakarmani !! O Man , do your duty without the attachment of fruit of it, so do not attach yourself to the result of your work. also do not pull yourself in not doing your work. Yada Yada Hi Dharmasya Glanirbhati Bharata Abhuthanam Dharmasya Tadatmanam Srajamahayam . Pritranay Sadhunam Vinashchaya Cha Duskritam Dharma Sansthapnarthaya Sambhawami Yuge Yuge !! Whenever there is the loss of Dharama , then for the rise of Dharma , to help right people and to kill wrong people , to reestablish dharma , I take rebirth again and again . Na Mai Parthasthi Kartavayam Trishu Lokeshu Kinchanam, Nanwaptavayam Waptavyam Wart Av Cha Karmani. O ! Arjun there is nothing is as duty for me in the all three worlds, and there is no thing that can be achieved is not achievable by me. Still I work all the time. Ya Nisha Savabhtanam Tassyam Jagruti Sanyami, Yasam Jagruti Bhutani Sa Nisha Pasyato Muni ! A night for normal person is infact the day or moment of awakening of a sage , and the day for normal person is infact the night of a introspective sage. Vasansi Jirnani Yada Vihay , Navani Gruhati Naroparani, Thatha Sharinani Vihay Jirna , Nanyani Sanyati Navani Dehi ! Like a person leave his old clothes and wear new clothes , same way the soul leave a old body and enters in a new body. Nanam Chidanyanti Shastrani , Nanam Dhahati Pawaka , Na Chainam Kalendayanto Na Sosyati Maruta ! The soul can not be cut by any type of weapon, and can not be burned by fire. It can not be wet by water and can not be dried by air. In fact the Gita is the ocean of Knowledge , each of its slok or quote can be interpreted in many ways . I tried my best to give you meaning or translation of these Bhagwat Gita Quotes as the best of my knowledge, however if there is any mistake please let me know. Do not forget to share this article. Thanks for visiting our blog DigitalSafalta.